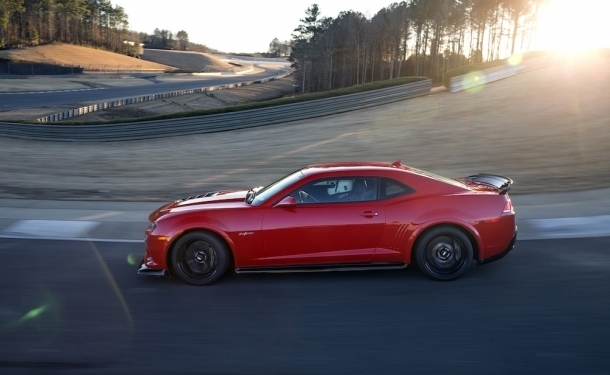 DETROIT – Lightweight, nimble and incredibly powerful, the original Z/28 was designed for road racing. The 2014 Z/28 carries the same spirit, with every detail engineered specifically to create the ultimate track-capable Camaro. Reduced curb weight: The naturally aspirated Z/28 weighs 300 pounds less than the supercharged Camaro ZL1 and 55 pounds lighter than the Camaro 1LE – with changes ranging from lightweight wheels to thinner rear-window glass. To enhance the balance and overall driving feel of the Z/28, 100 percent of the unsprung mass – suspension, wheels, tires and brake system – differs from the Camaro SS. “Like the first-generation Z/28, the new model is a road racer first and foremost. It features a wide range of state-of-the-art exterior performance modifications, and weight-reduction measures. 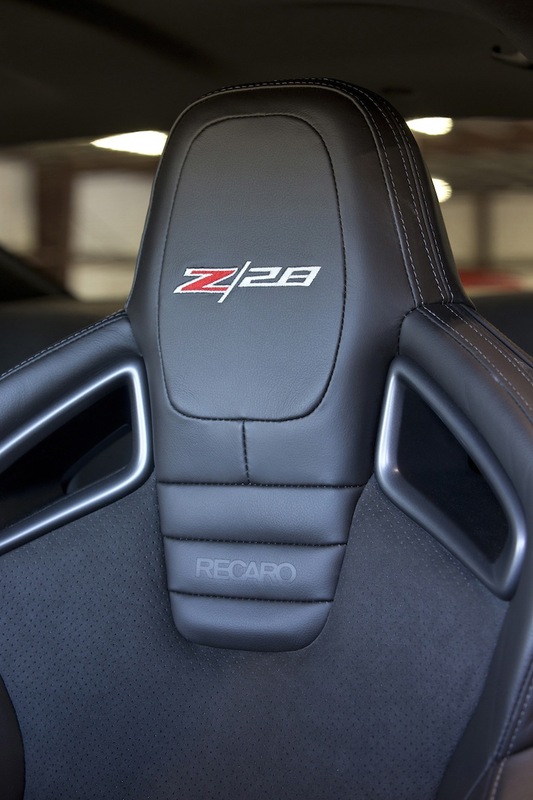 It was bred for the track, pure and simple,” said Mark Stielow, Camaro Z/28 engineering manager. With the driving goal focused on peak performance capability, nothing on the exterior is without purpose. It shares several racing-inspired, design best practices and lessons learned with the 2014 Corvette Stingray. New and revised exterior content was developed to improve aerodynamics, powertrain cooling and brake-system cooling, helping the Z/28 produce 150 pounds of downforce at 150 mph. Here are 28 features that helped the Camaro Z/28 lap Germany’s famousroad course four seconds faster than the Camaro ZL1. The aerodynamic coefficient of drag goal was achieved with original Camaro SS content and an accessory rear spoiler, but to meet the downforce requirements for Z/28, the spoiler was modified with a “wickerbill” – a small, vertical tab at the edge of the spoiler. Although an aesthetically minor change, it helped improve rear lift performance by 70 counts. That allows the Z/28 to handle turns at higher speeds and deliver greater overall high-speed stability. The Z/28’s unique front fascia is based on the Camaro SS, but the fog lamps, air dam and the upper-base grille are replaced with covers that reduce weight from deleting fog lamps, an air duct support bracket, an airflow-optimized grille for enhanced cooling and a modified fascia bottom that incorporates provisions for the brake cooling ducts. They funnel air from the lower grille to the wheelhouse liners and the unique splitter. The Z/28’s front splitter is a large aero panel that provides downforce at the front of the car, enhancing cornering capability and high-speed stability. 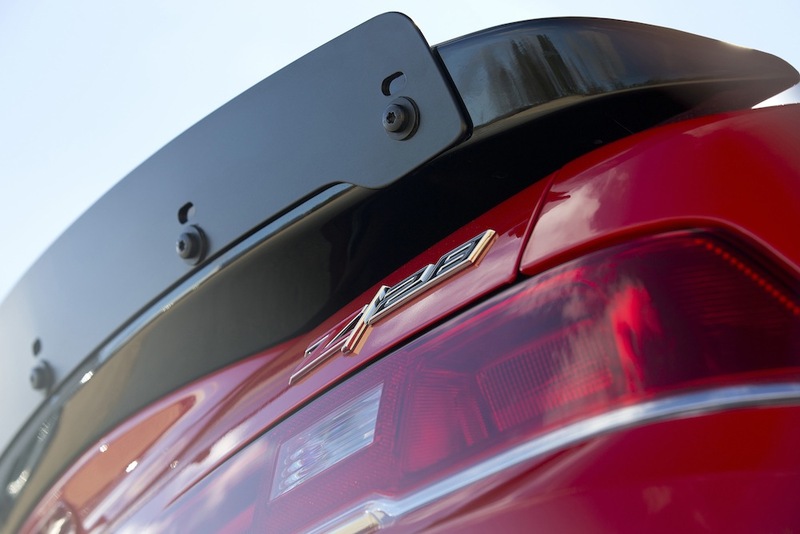 Designed to withstand 250 pounds of downforce at its tip, it is matched with an aero closeout panel under the front of the engine compartment that also enhances aero characteristics – along with molded-in aero features forward of the front wheels. A functional carbon fiber hood extractor provides increased engine cooling by allowing hot air an exit route. The design is similar in function to the extractor featured on the Camaro ZL1. Specific rocker moldings provide aggressive styling and improved aerodynamic performance, while unique wheel flare moldings cover the Z/28’s wide tires. Deflectors at the bottom-front corners of the front wheel flares contribute to the car’s downforce-producing aerodynamics. Unique wheelhouse liners with closeouts work with the vehicle underbody to make the most of airflow. The Z/28 underbody incorporates a belly pan that helps reduce front lift. Developed using computational fluid dynamics and wind-tunnel testing. It provides an aero benefit and contributes to drivetrain cooling. Modified NACA duct profiles are designed to draw air into the underbody tunnel area, where the highly energized air provides extra cooling for underbody components affected by the exhaust heat energy of the LS7 engine. Making the most of mass is a key component of the Z/28’s performance capability, contributing to a balanced feel and a high power-to-weight ratio. With a curb weight of 3,820 pounds and 505 horsepower (376 kW), the Z/28 has a power-to-weight ratio of 7.6:1 – or one horsepower for every 7.6 pounds of the car’s mass. That compares favorably to other performance coupes, including Audi RS 5 (8.9:1), BMW M3 (8.9:1) and Porsche 911 Carrera (8.7:1). The Z/28’s curb weight is approximately 300 pounds less than the ZL1 and about 55 pounds less the 1LE, despite features that add mass, including a dry-sump oiling system with a 10.5-quart reservoir, higher-mass chassis and suspension components such as the support brackets for the front splitter. Engineers offset the mass of those necessary features with a targeted weight-loss program that trimmed the Z/28 to the essential elements of performance. Reducing the thickness of the rear window glass from 3.5 mm to 3.2 mm saved 400 grams. Although it looks like the rear seat in the SS, the Z/28’s rear seat is 4.7 kilograms lighter due to reduced seat foam and a fixed seatback design with no folding/pass-through feature. The Z/28’s 19-inch aluminum wheels save 8.7 kilograms compared to Camaro SS wheels. 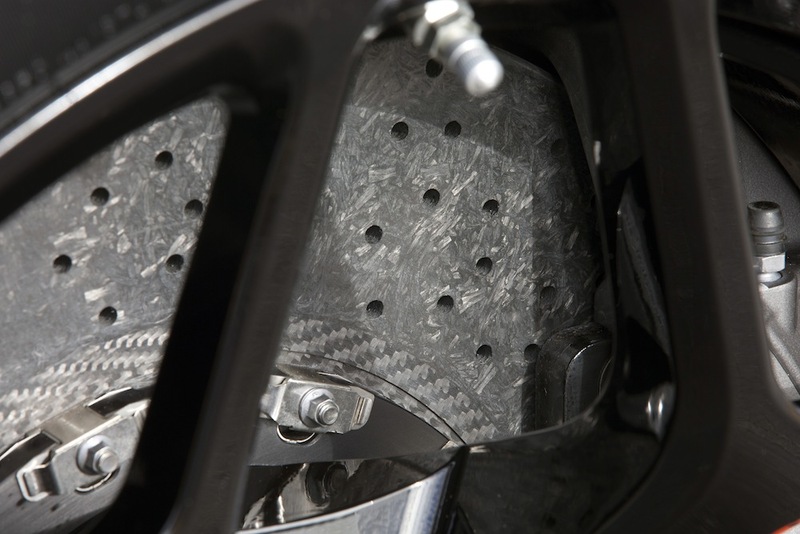 Their thin split-spoke design features a back-cut at the rim, reducing mass at the outermost area of the wheel – and reducing spin inertia by 5 percent, for enhanced performance. They are matched with track-capable tires that save 13.2 kilograms per vehicle, compared to the SS. Lighter than comparably sized steel brake rotors, the Z/28’s carbon ceramic rotors save 9.6 kilograms, while also reducing un-sprung weight for immediate, responsive handling. Because the Z/28 is intended for the track, air conditioning was deemed non-essential component. The deletion saved 12.9 kilograms. Air conditioning is available as an option. The Camaro Z/28’s powertrain is rooted in the 7.0L LS7 engine that made the Corvette Z06 an instant performance icon. With an SAE-certified 505 horsepower (376 kW) and 481 lb-ft of torque (652 Nm), it complements the lightweight vehicle components to give the car its 7.6:1 power-to-weight ratio while delivering the power to accelerate strongly out of corners and achieve high straightaway speeds. A close-ratio six-speed manual transmission is the only transmission offered and power is distributed to the rear wheels via a limited-slip differential featuring a helical gear set, rather than traditional clutch packs. The new design enables the driver to apply more power and get through corners faster, by continuously adjusting the torque bias to maximize available traction. The differential works in unison with Chevrolet’s proprietary Performance Traction Management system, which allows drivers to adjust the level of throttle and brake intervention to match their capability and driving environment. The racetrack-bred LS7includes features designed for the high-rpm environment of the track, including a durable forged-steel crankshaft, lightweight titanium connecting rods and high-flow cylinder heads with lightweight titanium intake valves. It also features a racing-style dry-sump oiling system that helps ensure adequate oil pressure during high-load cornering. The LS7 uses a unique open air box intake system to make the most of high-rpm airflow into the engine. It features a K&N conical air filter and delivers the highest airflow performance of any production Camaro filter system. The air cleaner seals around bottom of the hood, reducing the chance of recirculated hot air being drawn into the engine. Engineered to meet the fueling demands of the high-output LS7 engine during aggressive driving maneuvers, the road course-ready fuel system is designed to keep the primary fuel pump reservoir full even under hard cornering and maximize the amount of fuel available during high-performance maneuvers around the most grueling road courses. The 2014 Z/28’s dual-mode exhaust system is engineered to provide high-flow and muscular sound character under aggressive acceleration, while attenuating noise levels in cruising conditions. It actively controls valves that change the flow path of the exhaust for the desired performance, depending on transmission gear and engine speed. With the valves open, the system produces less back pressure and more power from the engine. Additionally, the converter assembly has been modified to increase flow and horsepower. Used in the Camaro ZL1 and Cadillac CTS V-Series, the TREMEC TR6060 six-speed manual has the capability to stand up to high-performance engines, with short throws, smooth gear synchronization and excellent shift feel. Design features include a combination of double-cone and triple-cone synchronizers on all gears. Double-cone synchronizers have two friction surfaces to affect gear acceleration and triple-cone synchronizers have three friction surfaces – the greater the friction surface, the easier the transmission is to shift. The Z/28 uses a 5.1-ratio short-throw shifter that provides quicker, more precise-feeling gear changes – similar to ZL1 and SS 1LE models. 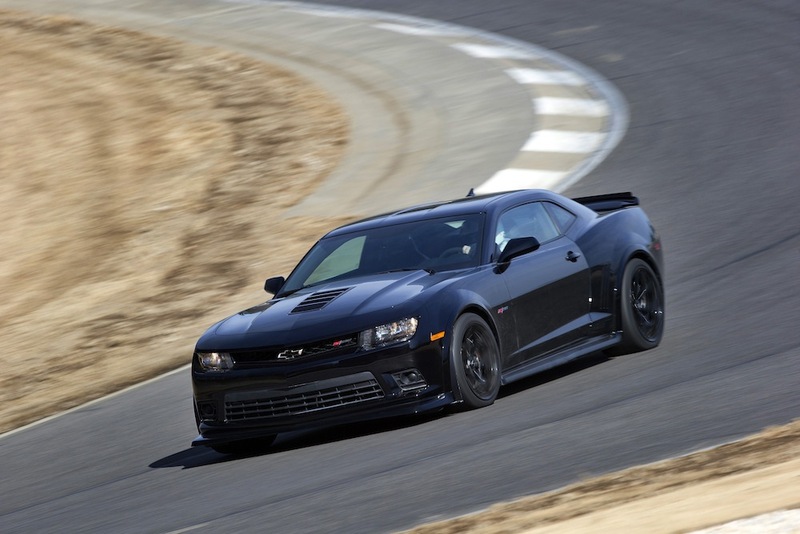 The Z/28’s performance focus is maximum cornering, braking and lap times. Comprehensive chassis and suspension changes, including a lower center of gravity, specific stabilizer bars, higher-rate coil springs and other chassis and suspension features, enable more than 1.05 g in lateral acceleration and 1.5 g in deceleration. Racing-bred dampers, tires and carbon ceramic brakes play important roles in predictable and consistent maximum performance with every lap. The Z/28 uses the same tower strut brace as the Camaro SS 1LE to provide extra chassis stiffness by tying the towers together. It transmits the load of each strut tower during cornering via tension and compression of the strut bar, which shares the load between both towers and reduces chassis flex. A high-performance, zero-preload limited-slip differential is employed to make the most of cornering capability and cornering exit traction. It features a concentric helical gear set that generates friction proportional to the input torque and allows continuous torque biasing and differentiation to be managed between the drive wheels. A conventional limited-slip differential uses preloaded clutch plates and springs to create a fixed amount of friction that is always present). As torque increases from the engine, the separation forces in the gears increase to drive increased friction, maximizing the capability of individual-wheel antilock brake function during corner-entry braking, mid-corner speed and corner-exit traction. On the track, that translates into quicker lap times, by allowing the Z/28 to put down more power in the turns, with greater traction, greater handling precision and enhanced steering centering. The axle ratio is 3.91. The Z/28’s differential cooler pulled from the knowledge gained in developing the ZL1, which is unlike that found in other sports cars. It incorporates an integral heat exchanger, eliminating the need for an external pump, wiring, relays, temperature sensors and fan. This innovative system pumps overcooled transmission fluid to a heat exchanger inside the differential housing, which removes excess heat from the differential fluid, reducing temperatures by more than 100 degrees F, helping the differential maintain cool, stable performance throughout the most aggressive road course sessions. This higher-durometer part offers 50-percent greater stiffness at high load than the SS, improving steering feel and brake force deflection steer while providing more consistent performance for continuous road-course driving. Additionally, the lower control arm lateral link handling bushing is revised on all 2014 Camaros for more consistent track performance. The “P-bracket” bushing for the rear upper control arms is redesigned with increased durometer and eliminated voids to improve lateral stiffness during hard cornering, as well as toe-change compliance during braking. The stiffness rate of this part is increased 400 percent, compared with the SS component. Similarly, 25-percent stiffer lower inner and outer trailing links bushings deliver improved lateral stiffness during hard cornering and reduced toe-change compliance during hard braking. Engineers increased the stiffness rate of the Z/28’s coil springs – the amount of energy required to compress them – by 85 percent in the front and 65 percent in the rear. The specific tuning of the springs reduces body movement, which allowed the engineers to use smaller, lighter stabilizer bars to maximize grip during hard braking, cornering and acceleration. The solid stabilizer bars are 25mm in diameter in the front and 26mm in the rear – compared to the 28mm front and 27mm solid bars used on the Camaro SS 1LE. The Z/28 is the first high-volume production road car to employ racing-derived DSSV® or Dynamic Suspensions Spool Valve damper technology from Multimatic. The dampers rely upon a pair of self-piloted spool valves to control fluid through tuned port shapes rather than conventional deflected disc dampers. The design of the inverted-monotube front strut and aluminum-body monotube rear hydraulic dampers offers maximum response, stiffness and tuning optimized for the track, with the highest level of damper predictability, accuracy and repeatability. In short, they deliver optimal wheel control and vehicle control – and they provide almost double the stiffness when compared to the dampers on the Camaro SS 1LE. Performance Traction Management, or PTM, is an advanced system that integrates the chassis mode selection, Traction Control and Active Handling Systems, tuned specifically in the Z/28 for optimal road-course performance and consistency. PTM allows the driver to press the accelerator pedal to wide open at the exit of the corner and manages acceleration based on the given vehicle dynamics. Five performance levels or modes are available to accommodate a variety of driving conditions. 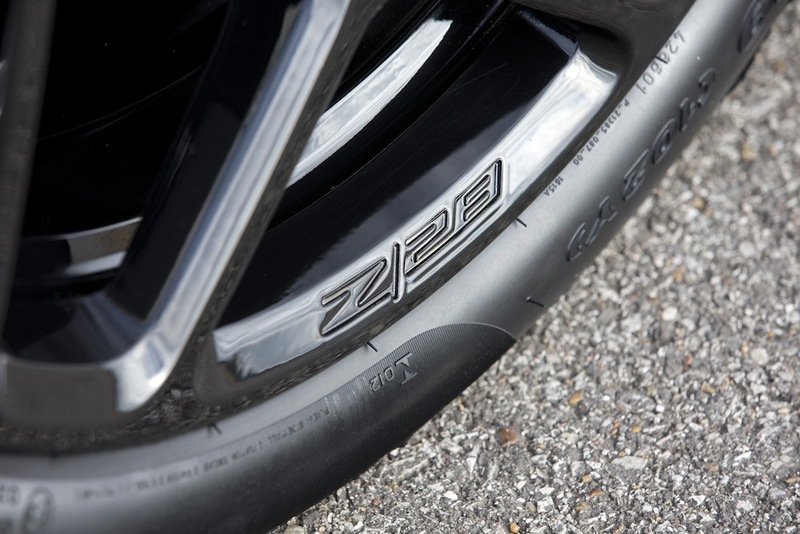 A major contributor to the lateral performance of the Z/28 is the wheel-and-tire combination, featuring the widest front wheels/tires of any comparable sports coupe. Engineers incorporated a comparatively smaller, 19-inch package, with P305/30/ZR19 tires front and rear – mounted on 19×11-inch front wheels and 19×11.5-inch rear wheels – which contributed to lowering the center of gravity 33mm, for enhanced handling. The forged aluminum wheels are lighter and stiffer than comparable SS wheels, and they’re used with Pirelli PZero Trofeo R motorsport compound tires. Designed for summer use on the street, the tires’ unique compound was developed for the track and provides a large patch for maximum grip. They also offer a 29.5-pound weight advantage over Camaro SS tires. Large, robust and track-capable Brembo® carbon ceramic matrix brakes deliver exceptional braking capability, while weighing in 9.6 kilograms under the comparable Camaro SS brakes. The brakes offer unmatched levels of brake feel, lap after lap, with tremendous fade resistance, and the Z/28 is expected to produce 60-0 mph stopping distances of less than 120 feet. The system includes large, 15.5 x 1.4-inch two-piece front rotors matched with fixed monobloc, six-piston front calipers, and 15.3 x 1.3-inch two-piece rear rotors with four-piston calipers. They also feature high-performance pad material with increased pad surface area, and electronic pad-wear sensors.